Shop Display Automaton - Father Christmas 1950s. 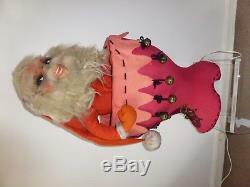 Large Santa in a boot - super rare and collectible - this old Santa pops in and out of the boot. Our family of Nottingham shopkeepers have never seen similar and was a shop Christmas decoration for some years. Showing a little some age and wear but a full character addition to display - or just in corner of a room. He stands 78 cm tall when not extended so a real show stopper moving up & down. Works reliably well and was electrically checked in 2016. The item "Animated Santa Claus Original Christmas Figure Shop Display 1950s" is in sale since Sunday, October 7, 2018. This item is in the category "Home, Furniture & DIY\Celebrations & Occasions\Christmas Decorations & Trees\Figurines". The seller is "expouk0" and is located in Hull. This item can be shipped to United Kingdom, Antigua and barbuda, Austria, Belgium, Bulgaria, Croatia, Cyprus, Czech republic, Denmark, Estonia, Finland, France, Germany, Greece, Hungary, Ireland, Italy, Latvia, Lithuania, Luxembourg, Malta, Netherlands, Poland, Portugal, Romania, Slovakia, Slovenia, Spain, Sweden, Australia, United States, Canada, Brazil, Japan, New Zealand, China, Israel, Hong Kong, Norway, Indonesia, Malaysia, Mexico, Singapore, South Korea, Switzerland, Taiwan, Thailand, Bangladesh, Belize, Bermuda, Bolivia, Barbados, Brunei darussalam, Cayman islands, Dominica, Ecuador, Egypt, Guernsey, Gibraltar, Guadeloupe, Grenada, French guiana, Iceland, Jersey, Jordan, Cambodia, Saint kitts and nevis, Saint lucia, Liechtenstein, Sri lanka, Macao, Monaco, Maldives, Montserrat, Martinique, Nicaragua, Oman, Pakistan, Paraguay, Reunion, Turks and caicos islands, Aruba, Saudi arabia, South africa, United arab emirates, Ukraine, Chile.